I am a social worker by day, and an ambitious chef by night. Witness my culinary quest to never cook the same dish twice. Aaaaaaand today you get a made up appetizer with a made up name that consists of ONE ingredient! My mom and niece got the idea for this adorable snack from a teriyaki restaurant they recently went to. It was perfect to include at my mama’s Garden Party a few weeks ago, that she hosted for friends and gardening clients (she is a professional licensed horticulturist, as well as landscaper and gardener!). These are super easy to make (though a bit time-consuming, I must admit), but are very cheap – only about $5 for a bag of oranges! I suppose you could say it involves 2 things, if you include the toothpicks (which are NOT edible, therefore can’t be called an ingredient, hehe). The instructions may seem kind of complicated, so definitely use one or two oranges as a test-orange, and refer to the pictures! Feel free to comment or email with questions. -Cut each orange in half. -Take one half, and cut off the end, very thinly. 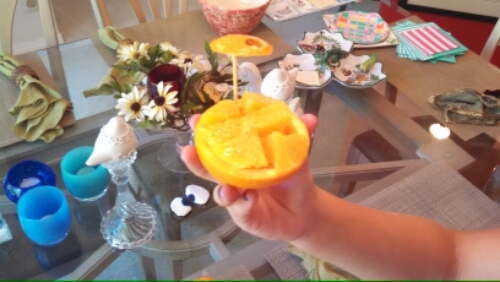 -Using a knife, carefully cut out the inside of the orange. 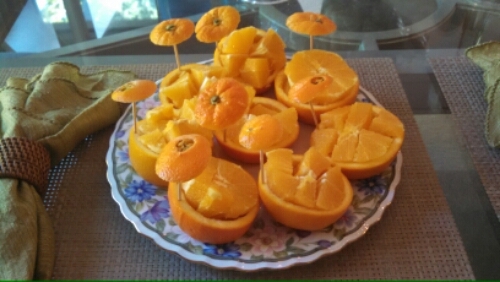 -Cut the orange insides into 6 pieces. -Place the thin slice you previously cut inside the carved out orange and push down to sort of seal it. Then place the 6 pices back inside the carved out orange. -Take a toothpick and stick it into the carved out peel, and attach the peel to the top. Enter your email address to follow my cooking adventures! Come in to my kitchen! Men's Sport Shirts, Blazers, & Pants | Thomas Dean Co.